The service that I get exceeds my expectations. Peter is very prompt and thorough. I am definitely likely to recommend Elliot Whittier to others. Our claim was settled fairly and honestly. You guys have been great. We are very satisfied with all of the dealings with your firm. Connie, Amy, and Wayne have all been especially great. Should you ever need a reference, please feel free to give my information. The service is excellent. Connie is always professional, always responsive and always there for me. I am very likely to recommend Elliot Whittier Insurance to others. I LOVE Elliot Whittier Insurance Services, LLC I had an issue with getting a permit and my agent Andrew called me on his vacation just to check in with me. Above and beyond service. I can't leave out Barbara and John. They are all rock stars!!! The service that I get from my account representative Connie is excellent, she is a star and responsive to any needs that I have surrounding my insurance policies. 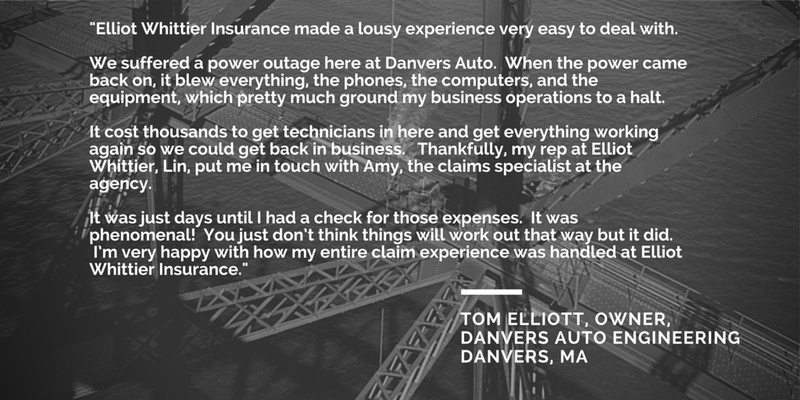 I am highly likely to recommend Elliot Whittier Insurance to others.